IPPRED This form allows you to research protein partners potentialy linked by an interaction relation. Database of Interacting Proteins (DIP) The DIPTM database catalogs experimentally determined interactions between proteins. It combines information from a variety of sources to create a single, consistent set of protein-protein interactions. 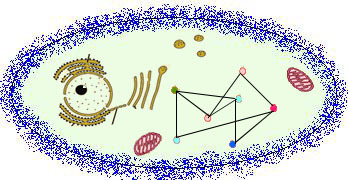 The data stored within the DIP database were curated, both, manually by expert curators and also automatically using computational approaches that utilize the the knowledge about the protein-protein interaction networks extracted from the most reliable, core subset of the DIP data. Human Protein Reference database (HPRD) The Human Protein Reference Database represents a centralized platform to visually depict and integrate information pertaining to domain architecture, post-translational modifications, interaction networks and disease association for each protein in the human proteome. All the information in HPRD has been manually extracted from the literature by expert biologists who read, interpret and analyze the published data. HPRD has been created using an object oriented database in Zope, an open source web application server that provides versatility in query functions and allows data to be displayed dynamically. IntAct IntAct provides a freely available, open source database system and analysis tools for protein interaction data. All interactions are derived from literature curation or direct user submissions and are freely available. These database searched by Gene name, UniProtKB Ac, UniProtKB Id, Pubmed Id. Biomolecular Object Network Databank (BOND) BOND is the Biomolecular Object Network Databank - a powerful new databank that combines sequence, interaction, and related interactome data and content. BOND contains Genbank and BIND data as well as related tools and information. BOND combines various data silos into one resource. The Molecular INTeraction database(MINT) The new MINT database structure is based on the Intact data model (http://intact.sourceforge.net/uml/intactCore.gif). It focuses on experimentally verified protein interactions mined from the scientific literature by expert curators. The curated data can be analyzed in the context of the high throughput data and viewed graphically with the 'MINT Viewer'.MINT has signed the iMEX agreement (http://imex.sourceforge.net/) to share curation efforts and supports the Protein Standard Initiative (PSI) recommendation. The full MINT dataset can be freely downloaded. Reactome The Reactome project is collaboration among Cold Spring Harbor Laboratory, The European Bioinformatics Institute, and The Gene Ontology Consortium to develop a curated resource of core pathways and reactions in human biology. The information in this database is authored by biological researchers with expertise in their fields, maintained by the Reactome editorial staff, and cross-referenced with the sequence databases at NCBI, Ensembl and UniProt, the UCSC Genome Browser , HapMap, KEGG(Gene and Compound ), ChEBI, PubMed and GO. In addition to curated human events, inferred orthologous events in 22 non-human species including mouse, rat, chicken, puffer fish, worm, fly, yeast, two plants and E.coli are also available. A description of Reactome has been published in Genome Biology. Reactome is a free on-line resource, and Reactome software is open-source. However, please take note of our disclaimer. The Munich Information Center for Protein Sequences (MIPS) The Munich Information Center for Protein Sequences (MIPS) is a research center hosted at the Institute for Bioinformatics (IBI) at Neuherberg, Germany with a focus on genome oriented bioinformatics, in particular on the systematic analysis of genome information including the development and application of bioinformatics methods in genome annotation, gene expression analysis and proteomics. MIPS supports and maintains a set of generic databases as well as the systematic comparative analysis of microbial, fungal, and plant genomes. Escherichia coli dataset Yellaboina S, Goyal K, Mande SC. Inferring genome-wide functional linkages in E. coli by combining improved genome context methods: comparison with high-throughput experimental data. Genome Res. 2007 Apr;17(4):527-35. Yeast dataset Ben-Hur A, Noble WS. Kernel methods for predicting protein-protein interactions. Bioinformatics. 2005 Jun;21 Suppl 1:i38-46. Helicobacter pylori dataset S. Martin, D. Roe, and J.-L. Faulon (2005), "Predicting Protein-Protein Interactions using Signature Products," Bioinformatics 21(2):218-226.